Are you looking for a Tree Company in the Bronx? Bronx Tree Services Corp. offers tree care services to both residential and commercial customers throughout the entire borough of the Bronx and we offer an excellent customer experience for reasonable rates. Our Services include tree trimming, tree pruning, tree removal, stump grinding/removal, cabling/bracing, hazard tree inspection and post storm damage clean-ups. As the top Tree Company in the Bronx our staff will get the job done right the first time! At Bronx Tree Services we’ve been helping homeowners improve the quality of their landscapes safely and effectively for over 50 years. Our wide range of services, knowledgable start and dedication to doing what’s best for our clients and their properties make us a truly full service firm. Our crews are highly skilled in the practice of removing trees while keeping the people, property and other assets nearby out of harm’s way. 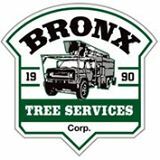 Bronx Tree Services Company is a full service tree business. Every service begins with a complimentary, no-obligation, onsite consultation with a local certified arborist. Contact us to make an appointment with an arborist and get a free estimate for the tree work you need.